This year I have had my first Christmas shop at Aldi. Over the course of 2014 I have become more and more of a regular shopper there, and am always intrigued by the new and limited edition items. Yes folks, I even downloaded the app. They out did themselves this Christmas, with all sorts of intriguing goodies, from interesting flavours of crisps to posh nosh such as caviar. One main area that really caught my attention was the cheese selection, and I know I over did it on my purchases but to someone who writes at Foodstuff Finds the selection of goodies has been a complete Aladdin's cave, and the fridge is jam packed with an impressive selection. I didn’t even buy the Christmas Pudding cheese as I missed the boat with it, discovering it too late but fear not I already have four more blocks in my basket! 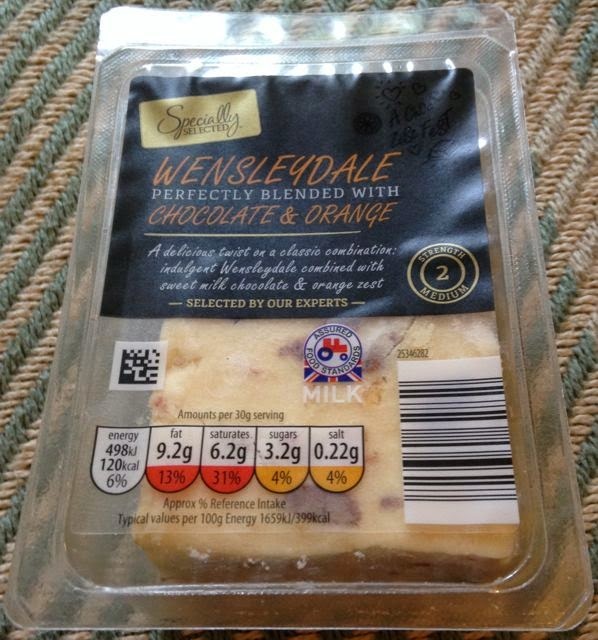 Anyway I have already tried the Mature Cheddar with French Champagne, but the next on my list to open was this weird sounding Wensleydale with Chocolate and Orange. The other interesting cheeses all have sell by dates well into mid January, thankfully, but I’ll get there. For a lot of people Christmas is synonymous with receiving a chocolate orange and eating a cheese board at some point during the season. Aldi thought they would combine these two events into one and created a cheese flavoured with chocolate orange. When I took the cheese out of the packet I admit it, I was genuinely alarmed by the amount of chocolate running through this cheese. We are not talking about the occasional chocolate chip, it is everywhere, tons of it in quite surprising proportions. There was also a lot of orange peel there too, it looked like it was going to be packed with flavour. Surprisingly though the cheese wasn’t that bizarre. The chocolate sections were very mild, and weren’t too strong, just a nice cocoa hint. The heaviest flavour was the orange peel, which added a good citrus zest throughout and nice bit of texture. Wensleydale is a creamy crumbly cheese and can carry sweet fruit really well, it is often paired with apricots on the deli counters. It carried the chocolate and orange surprisingly well, and made an interesting and well balanced flavour. I have to admit I was impressed, I just thought the chocolate would overpower everything, but no it worked remarkably well. This would be perfect as a dessert cheese after a meal, cleverly mixing a twist of sweet and savoury. this is awesome cheese! so unbelievably smooth and moreish. just hope aldi bring it back next year. best cheese I have over had. 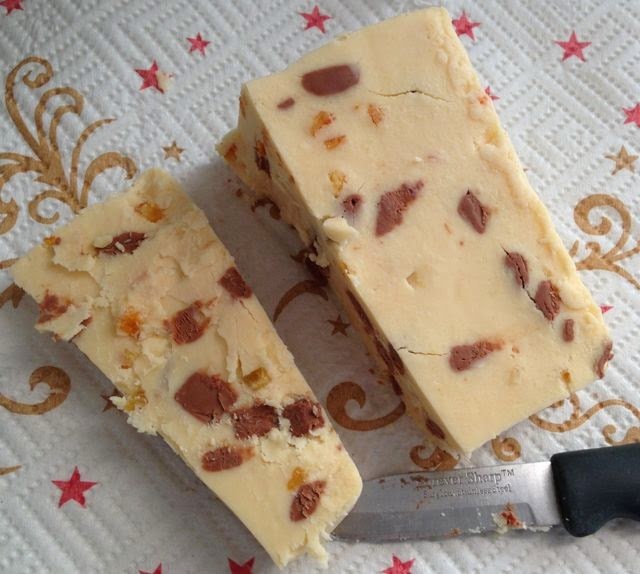 Did you try the Christmas pudding cheese they had too? I missed out on it - will try it next year if it is back. no I haven't tried that one but the wensleydale with cranberries is also delicious. 2nd to the chocolate orange one though!